It shows up in the background of old photographs of the Dekum Building: a stylishly inexplicable structure, only partially visible, with a fortress like cornice and towering twisted peaks that loomed over the intersection of Fourth and Washington. Overshadowed by its larger neighbor to the east, the angled views provide more questions than answers. What building was it? What style? Who built it? When? A similar view, ten years later, after the construction of the Third Street arches. 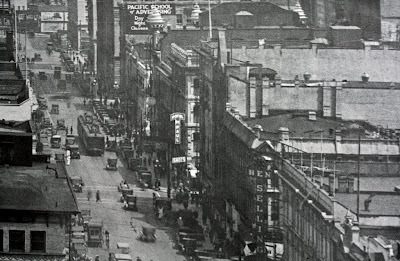 When I finally came across a view from a different angle, of Fourth Street in the 1920s, it provided no further clues, other than the fact that it had made it into the decade. Over the years "the building with the towers" proved elusive, always on the peripheral, never the direct subject of a photograph. How could anything so apparently elaborate pass undocumented? 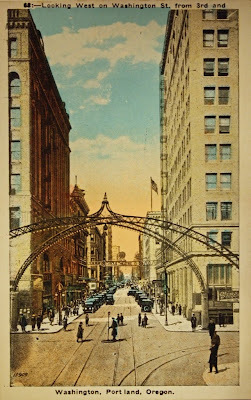 Fourth Street in the 1920s. The towers are visible near the Pacific School of Advertising billboard. The train is a Southern Pacific "Red Electric" interurban that ran as far south as Corvallis on the west side of the Willamette Valley. 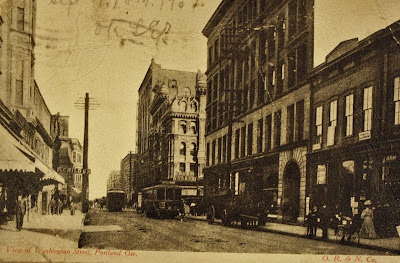 The breakthrough came in a booklet on Portland published in 1890 by the Oregon Immigration Board. Featured among the years new buildings, such as the Hotel Portland, the Marquam Grand, the Worchester Block, the Thompson-Burrel Block (New Market Annex) and the Union Passenger Depot (under construction) was the wildly exuberant Washington Block, so unlike its more reserved contemporaries. I had a name and a face, but no less of a mystery. Thus began a quest for the Washington Block that shuttled between the Central Library's microfilm readers and the John Wilson Special Collections rare book room, the Oregon Historical Society, the research library at the Architectural Heritage Center and a visit with architect / historian William Hawkins. Slowly bits of information came together to the story of an extraordinary Portland building. Even the inevitable parking lot ending took an unexpected turn. The New Market Annex, built in 1889. 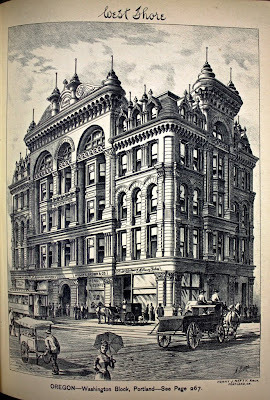 Portland was in the midst of an architectural transformation in 1889, the year the Washington Block was built. The final three cast-iron buildings in the city: the Blagen Block (1888) on First and C (later Couch Street), the Dodd Block (1889) and Glisan's Building (1889, the home of Kell's Irish Restaurant and Pub) were completed just as a new trend was sweeping the country. Overnight cast-iron was passe in Portland, in favor of the mass of brick and stone that characterized a Romanesque revival, often called "Richardsonian" for its most influential practitioner, Henry Hobson Richardson (see Portland Romanesque). The new style, the architectural equivalent of the transformation from Victorian to Arts and Crafts aesthetics, stressed simplified lines and highlighted material over ornamentation. Arches and stonework were prominent, a romantic nod to the pre-Gothic medieval. Brick was often (but not always) left exposed. Massive bases allowed taller building heights in the years just before steel beam construction. The Washington Block broke with as many of those conventions as it followed. 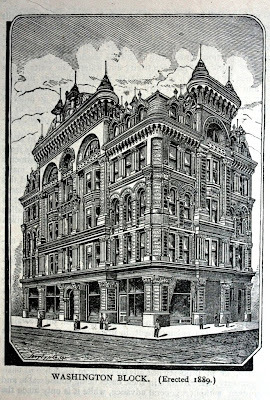 "The imposing five-story structure at the southeast corner of Fourth and Washington is one of the most ornamental buildings erected in 1889. It contains every improvement known to modern architectural art. The cost of this structure was about $75,000 all told." -The Oregonian, January 1 1890. 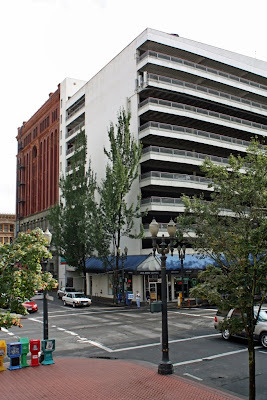 The office building was the project of Portland Pioneers William Fliedner (1832-1914) and Edward Holman (1850-1920). William Fliedner was born in Germany, Edward Holman in Brooklyn New York. Both arrived in Portland via ship and an overland crossing of Nicaragua, Fliedner in 1851, Holman in 1863. Both rose from modest circumstances, Fliedner was a barber, Holman an undertaker (Holman Funeral Services is in business to this day on Hawthorne), before investing in real estate later in life. They would sell the Washington Block in 1906 for $200,000. The architect they chose, Swiss borne Henry J. Hefty, created an eccentric, extravagant structure that contrasted with prevailing fashion. To the usual Romanesque arches and stonework he added bay windows tucked between pilasters and Gothic styled dormers above the roof line. The building was topped by two large ridge like cornices made of zinc, capped with swirling peaks, as if inspired by the same Wagnerian fairytale landscape that the Modernisme architects in Barcelona were drawing from at the time. To anyone who has ever looked at the lions and Libertys of the Blagen Block (1888) it is a puzzling statement that perhaps refers to the simplified lines of buildings such as the New Market Annex. The walls of the Washington Block were cement, a material used on some Romanesque revival buildings in Seattle and on the Skidmore Building (now included in the White Stag Block) on First to the north side of the Burnside Bridge. The cement was finished so as to recall stone. The West Shore noted that the Washington Block's foundations were the largest yet in Portland. The building was lit by electricity and had an elevator. A post card found at the Architectural Heritage Center's research library provides a rare street level photograph from the west side of the Washington Block. The First Congregational Church (1891). Architect Henry J. 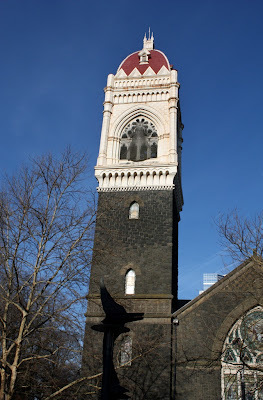 Hefty is best known in Portland for the First Congregational Church on the South Park Blocks. He also designed the New Grand Central Hotel (named after the original intended name for Union Station) that once stood on the site of the Portland Classical Chinese Garden, as well as his own home in the Holladay Addition. 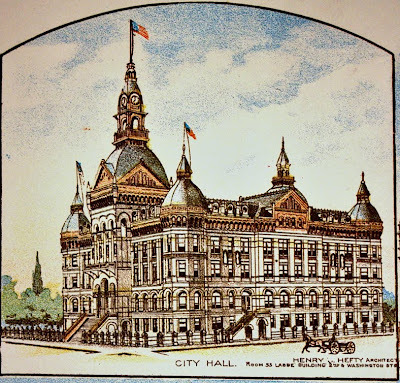 In 1890 he was selected to design Portland's city hall, but his huge building was deemed too expensive and "Kremlin like". Construction was halted shortly after the foundation was laid. In each of his Portland buildings he incorporated towers. Henry J. Hefty's never completed Portland city hall. 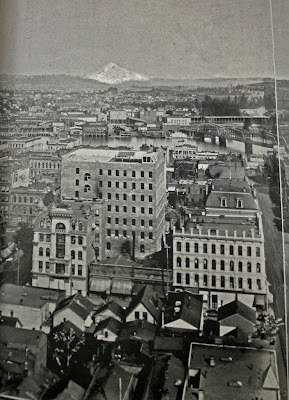 A portion of a panoramic view from the book the Oregon Souvenir (1892) taken from the town of the new Oregonian Building at Sixth and Alder. The Washington Block can be seen to the left. Next to it on the right is the Louvre Saloon and Cafe, beyond that, the Holton House hotel (later the Belvedere), one of Portland's furthest west cast-iron buildings. Both are described in detail in the next post below. Behind the Washington Block, overshadowing it literally and figuratively is the back of the Dekum Building, still under construction. (click on pictures to enlarge). The most audacious buildings of an era are often the quickest to show their age. The Washington Block was slated for demolition in 1931, but the plan was thwarted by the Great Depression. Three years later a new course of action was chosen, a radical remodel that removed the top four floors and added a new second story. The retention of the first level was perhaps to take advantage of the two foot thick walls and three inch by by eighteen inch floor joists as well as the enormous foundation, all mentioned in the Oregonian article that described the project. 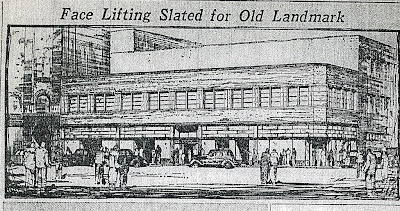 As often was the case in the 1930s, the building was described as a landmark, but with no mention of a impulse for preservation. The former Washington Block in 1935. 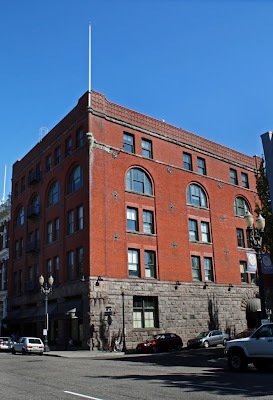 When the work was completed, what remained of the Washington Block was renamed the McGuire Building for long time Portland real estate broker Frank L. McGuire, who moved company there. It stood until 1963, when the entire half block on Fourth, between Washington and Alder, was torn down to make a parking structure. Does the foundation of the Washington Block lie beneath? Despite its seemingly inevitable sad ending--another fascinating investigation, Dan. And--congrats on finally having a program at the AHC! I'm sorry I ended up being no help (if Val ever even proposed my assistance to you) but hopefully my health is fully recovered, so at least I'll be able to be there on the 3rd. So glad I found this blog. Your writing is terrific. Thanks for this wonderful research with pictures and detailed street locations. I am looking for the Merchants Trust Bdg on 6th at Washington. Your work has been a great help. Armed with a coffee, I will go tomorrow to find it. I had long wondered what building my grandma had her picture taken in 1928 by the photographer D. Perry Evans (on 270 ½ SW Washington St). The Washington Block must have been an impressive site to a 16-year old girl from Bell Station. The quality of these photos is still good.